LUBBOCK – According to an evolutionary paleontologist, the earliest life formed when meteorites brought space molecules to earth four billion years ago. Sankar Chatterjee is a paleontologist at Texas Tech University who studies the origin of life on earth. In a video released last week by Texas Tech University, Chatterjee explains some of his recent findings on life’s origin and evolution. 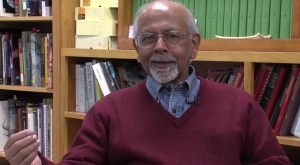 “The origin of life—this must be one of the oldest quests for scientists and philosophers,” Chatterjee states in the video. Chatterjee then explains that amino acids, sugar molecules, and phosphate are all basic building blocks of life, and that these molecules’ origins on earth have long puzzled scientists. However, he suggests, ancient meteorites may hold the key to the genesis of these important molecules. How then did these molecules join together to form life? According to Chatterjee, they were “cooked” by “Mother Earth” in hydrothermal crater basins. According to a recent article published by Texas Tech University, Chatterjee believes the ingredients brought to earth by meteorites included fatty membranes. Chatterjee claims his findings on the origin of life, which were presented during a recent meeting of the Geological Society of America, are truly revolutionary.